Did you know that the Surrey Food Bank helps about 14,000 families in Surrey and North Delta, every single month? 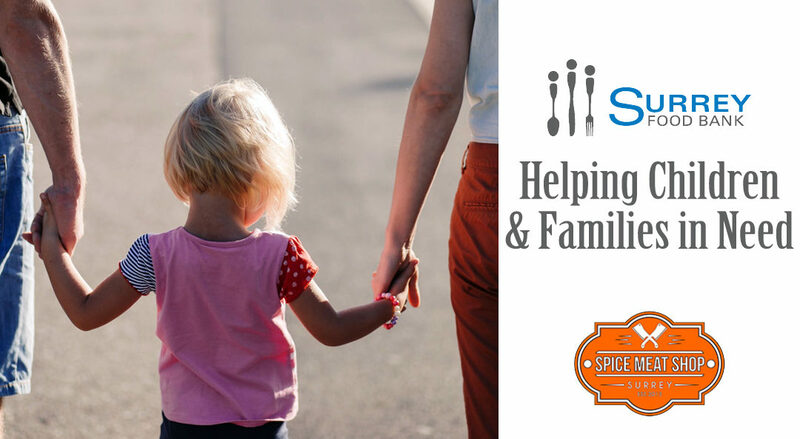 Spice Meat Shop wanted to do something different this December and the Surrey Food Bank is a great fit. While our business is about serving delicious food to our community, there are people who can’t afford it and worse, don’t have much in their cupboards all year long. Donating $0.50/pound of leg/thigh chicken sales to the Surrey Food Bank is our way of trying to help and support our community. December is a time when giving is highlighted and becomes top-of-mind, so we encourage you to dig deep into your cupboards and see if you have some things you could drop off at the food bank, or even here in our store where we have a drop off hamper as well. The Surrey Food Bank provides food to families living in Surrey and North Delta, in a respectful and dignified manner. As a non-profit, charitable organization, they operate because of donations of money and food. Their donations come from individuals, organizations and corporations plus they also benefit from various fundraising efforts. They do not receive any core government funding. In 2016 they provided over 54,838 hampers to families living in Surrey and North Delta. They provide food support for a number of recovery houses, safe houses, shelters, youth centres, soup kitchens, and specialty food banks in our communities. We hope this holiday season brings joy and happiness to families in our community and communities throughout BC and Canada. Even more, we hope that with the support of our patrons, we can help out during a time when food should not be a child’s first worry when they wake up in the morning. It’s a daunting task to help everyone, but every little bit helps! Happy Holidays from your Spice Meat Shop family.